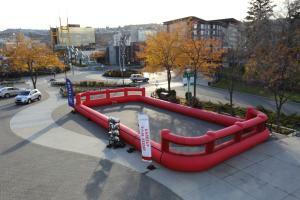 Hockey Canada Century Tour visits Kamloops and the 4 Nations Cup- bring your skates for a new experience! 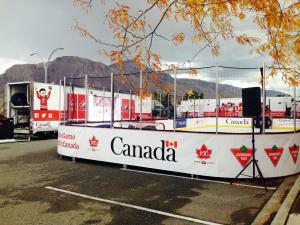 Running until Sunday in downtown Kamloops, you can step back in hockey history with a decade-by-decade timeline of Hockey Canada on the feature wall with vignettes of key moments in Hockey Canada history. 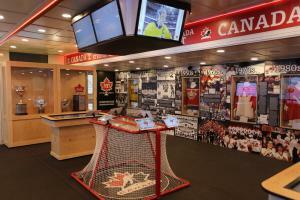 The caravan also features interactive tablet stations, a replica of a Hockey Canada locker stall where you can see what it’s like inside a Hockey Canada dressing room. 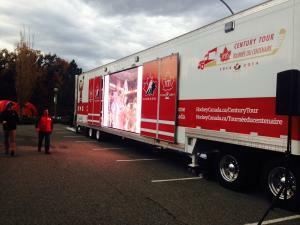 There is also a green screen that superimposes fans into an iconic Hockey Canada moment. And there is a really cool (not literally) synthetic ice surface for experienced players and newcomers to the game to lace up a pair of skates and take to the ice. Skates are available for children up to size 5 while everyone else will need to bring their own blades.